Such a simple recipe. Gulkhand is a childhood favorite. I will try these soon. This is such a fantastic stuffed dish Harini. Never really had Gulkand and to see it being stuffed is amazing. Must try sometime..
Thats a brilliant idea of stuffing gulkhand in rava laddoo. Very tempting sweet. I love gulkhand and these rava laddus look so tempting. I've yet to make rava laddus and your recipe is tempting me to do so. That is such a wonderful idea to stuff gulkand in ladoos. They look so tiny and super cute and must be bursting with flavours..
Gulkand in ladoo is very interesting and tasty idea..
Gulkand in itself is so delicious and flavoursome. In ladoos it must have tasted aesome. I love meetha paan and bought a large pack of gulgund. 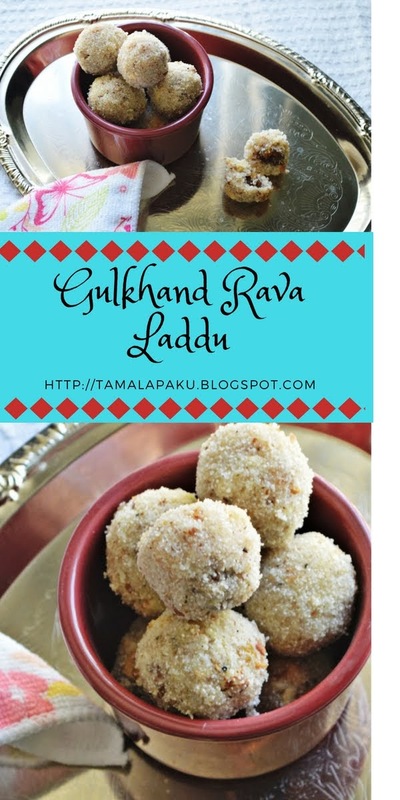 The pack has been sitting in my pantry forever now and I love this idea of stuffing rava ladoos with gulkund. I am going to try this soon. Aha now this is a surprise in the ladoo, no one will guess, awesome share. The moment I saw this on FB , I was literally imagining the taste and drooling over it. Love rawa ladoo and gulkand and this is a piece of heaven right!